August 1st, today is my first day going into the villages. I wasn’t exactly sure what I would be walking into or what to say to these pastors for that matter. I felt as though I was approaching a profit in the Old Testament. A high appointed man that God had chosen single handedly. This happens to be true though, here in India the gospel isn’t a well-known thing. The statistic for Christians in India is 2.3% and I was meeting that small percentage today. While I was nervous for my trip, I brought my three dear friends to journey with me on the long bus rides. The trip was a couple of hours or so; the adventure included taking 2 different buses to the first village and another bus including a long walk to our second village. You notice the stares are more intensive once you are leaving the home of ICM. As you venture to these outskirts for bus stops, you get into the small towns where American feet rarely touch. It was nothing to fear, but I was struck with the realization that this large number has never heard of the gospel. These pastors are the water to this community, and these people are dying to hear a message that will satisfy their thirst. I knew then how important it would be to get the message out to our American Brothers and Sisters in Christ back home. John Babu is the pastor and leader of the Village of Chinna V. He was born into a farming Christian family and decided to accept Jesus in 1993. He has been working for Christ for 13 years; with 7 of those years as a church planter. John has brought a total of 150 people to Christ and God is doing amazing things in his village. In part of his testimony for his people, John includes a story of how God miraculously saved him. He fell from a 4 story building and was unconscious for 20 minutes. He woke up sore walking away with no scratches as if nothing happened. This happens to be a great story for a people who constantly ache and sore. John Babu constantly has to explain to his people what it really means to be a Christian. In this village the poor caste people are called Christians, since Christians have always been known for helping the poor. The word Christian has officially become just a title and name with no sort of meaning. John is a well-respected man in his village. The Hindus don’t hate Christians but they don’t exactly like Christians either. You can tell that Gods’ light shines through John because even the unbelievers help him with the things he asks. John then begins to explain to us that the people in this village love Americans. A few years ago an American medical team came to the village and did surgery on two people with Thyroids in their necks. These people were saved and he says the village is so grateful for the Americans who do come through now. I then ask, “John what is the best way that we could help to make your community better?” He begins to explain how there is no water where he lives. That his people have to depend on boiling water and that the area is an extremely dry place. Rain only comes 4 to 5 months of the year and his people have to travel to other places during the year. He would greatly appreciate that some sort of water source be planted in the area. He prays that all the Castes would come to Christ and know who the true God is. John Babu has 3 young and joyful boys. They played and laughed and loved their dad even through the look of their eyes. Their names are Spurgen, Judson Taylor, and Johnson. Spurgen is 9 years old and loves to study. He just started 4th grade and is looking forward to the year. For fun he loves to play cricket as most Indian boys do. When I asked what he wanted to be when he grows up, he pondered and told me he wanted to become a pastor. He wants nothing more than to be a great servant of God. His favorite thing about God is the songs God puts in his heart and everything about sharing the gospel. The story of David is his favorite and he wanted people in America to know that Cars are awesome. Judson Taylor is 8 years old and enjoys learning the English language. He is going into the 1st grade this year. Being the middle brother as he is, he enjoys being rough with his brothers and playing with them. When I asked him what he wanted to be when he grows up, he told me a pastor as well! Praise God! His favorite thing about God is the fact that he can pray to the Almighty Creator at any point he wants to. His favorite Bible story is David and he wanted people in America to know that he is very thankful for you all, because you give him the opportunity to go to school. Johnson is 6 years old and is in Lower Kindergarten. He likes school and his favorite thing about it is his friend in his class. He was extremely shy when I interviewed him but as we know the apple doesn’t fall far from the tree. In a few years Johnson is bound to grow up and become a man of God. Inheritance specializes in taking care of the pastor’s children. We do this by giving the kids an English Education these pastors can’t afford. If the pastors pay for school, they will have to neglect their pastoral duties and work to support their kids. Please donate and help sponsor a child today. 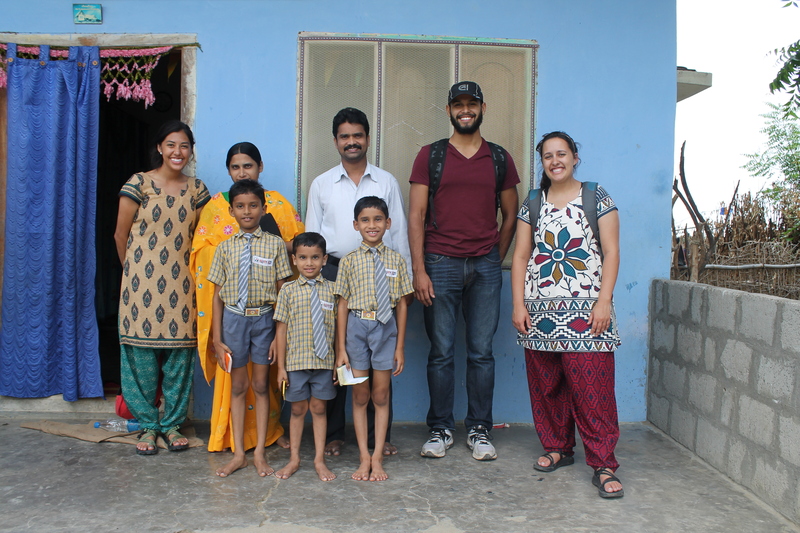 Pray for this family here in India to help spread the good news to your Brothers and Sisters in Christ!